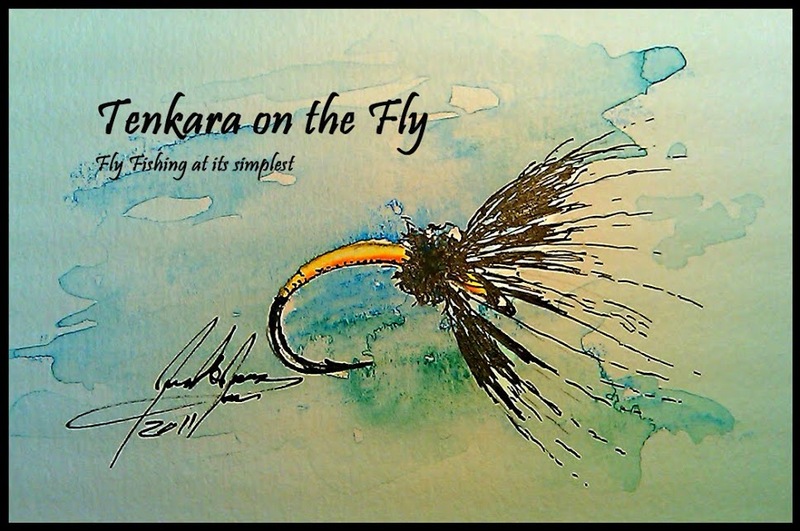 Tenkara on the Fly: Tenkara Iwana 12ft with Fuji Hook Keeper System and level line (fc). Tenkara Iwana 12ft with Fuji Hook Keeper System and level line (fc). My current setup, an Iwana 12ft from Tenkara USA with a level line (fluor carbon) of Chris Stewart of Tenkarabum and Fuji hook keepers. I am currently on the fence whether to keep the hook keepers or to change to a foam spool cut from a pool noodle (yes!). The hook keepers are great if you want to wind line quickly but they will kink up fluor carbon lines a bit (nothing that you can't stretch in less than 20 seconds though). Also, keeping the fly on can pose some issues if you'd put it in a backpack (get stuck, crush the fly). The foam spool is very light and can be pushed down the collapsed rod onto the grip. Foam Line Holder - left one is a Level no. 3 Fluor Carbon line, 12ft. and right is a TenakaraUSA furled line, 10.5ft. Like yourself, I am a new Tenkara fisher. I also own a TenkaraUSA 12' Iwana and I also use the Fuji hook keepers. I find that the hook keepers are very easy to use for transport between fish spots/pools and for brush bashing. I use it whether I have a level or furled line on the rod. I wind the line on kinda loosely, not too tight, and I find it uncurls very easily, definitely requiring a gentle stretch before resuming fishing at the new location. The level lines also require a gentle stretch thruout the day anyway to keep them nice and straight. I do that as I'm changing/redressing flies, which I have to do anyway. The furled line comes right off the keepers and ready to fish immediately. I made one slight addition to the keeper setup, though. I use the extra o-rings from the package and install them on the rod between the hook keepers. Then when I wind the line on the keepers, I hook the fly on one of the middle o-rings. The middle o-rings slide anywhere on the rod and stay where you leave them, providing perfect tension to maintain fly position/tension to hold everything in place for trips between fish spots. An easy roll of the o-ring with you fingers removes its grip on the fly hook and the fly drops off and ready to unwind line off hook keepers. Daniel @ Tenkara USA likes to use the spools because of the possible kinks to the lines like you mentioned, and I may start to use the spools like he recommends. I am a newbie to Tenkara, not to flyfishing. I especially love mountain streams like you and have many new(to me) techniques and equipment to experiment with. Email me if you want to. I would look forward to sharing my thoughts on this exciting new way to fish for trout. I am also seriously considering an Amago puchase and are very interested in your feelings about that rod. I simply love the Iwana rod. It boggles my mind how effective Tenkara fishing for trout has become. No more fly rod for me on a trout stream if it is anywhere near wadeable and suitable current flows, cover. Some dry’s creates twist on the level line/tippet when back-casting or on windy days. I use a small (smallest available) bb-swivel at about 8” below the rod tip for a 15’ level-line…seems to work without any impact to the presentation. Is it my casting or do others have the same experience? When that happens, you are likely fishing with a dry fly that is too big for the size tippet you are using. Another reason might be that the fly is not tied "symmetrically". Do you notice the swivel when casting? Does it change how the line casts?